The Gemini Control Center (GCC), developed by Prof. Dr. Daniel Görlich (Daniel@DocGoerlich.com), provided almost complete remote control and automation of the Gemini Astronomical Positioning System. With it, the observer was able to set most of Gemini's parameters remotely, access extended databases, and program observing sequences through user-defined entries. The GCC provided both a user-friendly interface and a customizable vehicle for operating a Gemini-connected telescope with control room comfort. It was also the first telescope control software of its kind to be developed, not only with visual astronomy in mind, but also to serve the needs of CCD imaging, photometry, and radio astronomy. 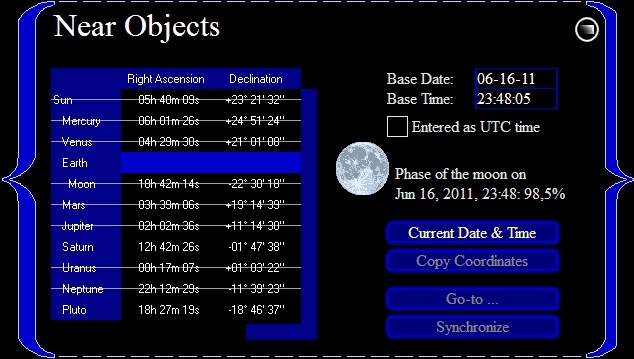 The following two screenshots show the GCC's Near Objects Screen, which calculated the position and current visibility of all the Solar System's planets, and the Earth's moon, every second to the second, and the Custom Mount Screen that let you define own German Equatorial Mounts that were not included in Gemini's default list of supported mounts. GCC has been discontinued in late 2015 following the release of Microsoft Windows 10. The introduction of Microsoft's new Universal Windows Platform, the advance of the ASCOM platform, and the missing RS232 ports in modern notebooks and laptops, would have required an extensive software redesign and new implementation of the GCC software. Old information as of November 2015: GCC supported all Gemini level 5 features. GCC had been designed for Windows and supported all Windows versions from Win95 till Windows 7, but could also work almost trouble-free with Windows 8 and 10. The support for Windows Vista (2007) and earlier versions, however, had expired. By using a virtual machine such as VMWare Fusion 2.x, one could also run GCC on Macintosh computers. GCC itself was not ASCOM-compliant, because it needed direct contact with Gemini in order to remotely control all its features and functions. However, one could use GCC and ASCOM applications at the same time by setting up an ASCOM Pass-Through Port as described in Appendix C of the GCC's Users Manual. GCC is no longer available for download, licenses can no longer be purchased, and customer service is no longer granted. You can, however, download the Users Manual, or send me an e-mail.